Here I'm rocking the Pantone colour for 2014 - Orchid. 365 Days of Color - You've Got to be Orchid-ing Me is Sunny's color of the month for February. A light creme orchid and I'm wearing 3 coats (though 2 would be fine). I've went with a ring and middle finger accent of Eat. Sleep. Polish. - Off With Her Head. A clear base with silver micro-glitter, silver and black hexes and red hearts. 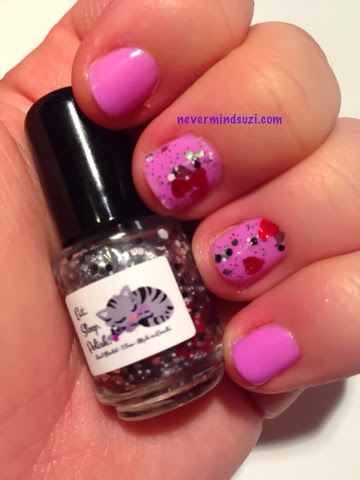 The perfect polish for the Red Queen - "Down with the Bloody Red Queen! !